Nobody's more aware of the difference than the American Institute of Architects. And in response to the paucity of public knowledge about the profession, the AIA decided to do something it's never done in its 157 years: advertise. The AIA is airing a 30-second spot created by the Purpose Institute (a unit of GSD&M in Austin), starting this past weekend through April 20. It's part of a three-year marketing effort that will reach across traditional and social media, but the TV buy (against programs, including "Face the Nation," "Meet the Press" and the PGA's Pebble Beach tournament) is the highly visible kickoff. "Architects appear in TV programs and movies, and it's clear that the public admires architects, but there's little comprehension of the real value they bring to contemporary culture and society," AIA president Robert Ivy told Adweek. "The time is right to change the perception." Or, in many cases, simply create the perception. And in architecture, that's far easier said than done. The classic image of the architect bent over his drafting table (or, these days, his AutoCAD program) represents only one part of a varied profession that involves everything from land use planning to historic restoration to construction economics. But since it wasn't practical to get all of that into a half-minute spot, the Purpose Institute chose a theme that anyone who's walked through a city can relate to: "Look Up." "When you think of architects, you think of tall buildings," said Purpose Institute president and co-founder Judy Trabulsi. "So we thought, 'Hey, everyone, look up.'" Using a graphic interplay between new and historic structures and shots of the natural landscape, the spot casts architects not just as engineers and draftsmen, but as multi-disciplinary problem solvers who integrate the built world with the natural one. "It makes [the profession of architecture] more approachable," Trabulsi added. 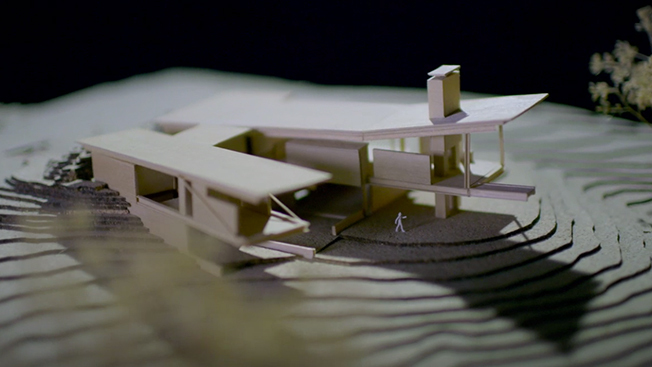 "It humanizes the architect." The "Look Up" theme is also a subtle but evident tap on the shoulder for countless Americans who troop down the sidewalk with their eyes trained on their smart phones. Ivy believes the architecture profession—and humans in general—would be better served by looking at the environments they live in every so often. "Look up from your handhelds," he said. "Who made the streets around you? Who made the city? Virtually every piece of the built environment was all made by architects, and usually for the better." "We were not prompted by the recession," Ivy said. "Through boom times and lean times, there's been an underlying need to emphasize the value that architects bring to the equation. We've been aiming at this for several years."